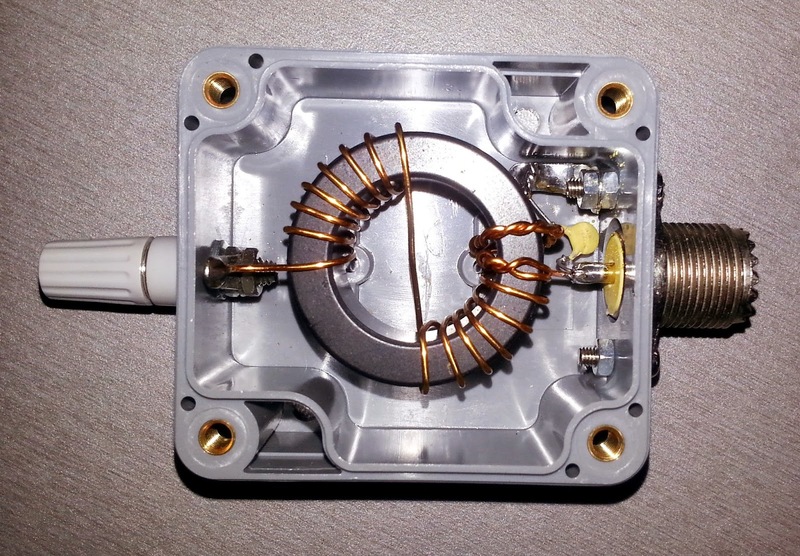 This is a 200 Watt PEP step up transformer for end fed full and half wave antennas without radials, designed as a 200 Watt PEP upgrade by PA0EJH for the originaly Par Electronics designed 25 Watt HF endfedz multiband end fed antenna. The original design has a 27/3 turn ratio ( 1: 81 ) on a small 43 material toroid, but the larger toroid has more wire so the nr of turns had to be reduced for max.efficiency on 10m. The coil now has a 16/2 ratio ( 1: 64 ) For max. performance the 2 turns to ground must be twisted . 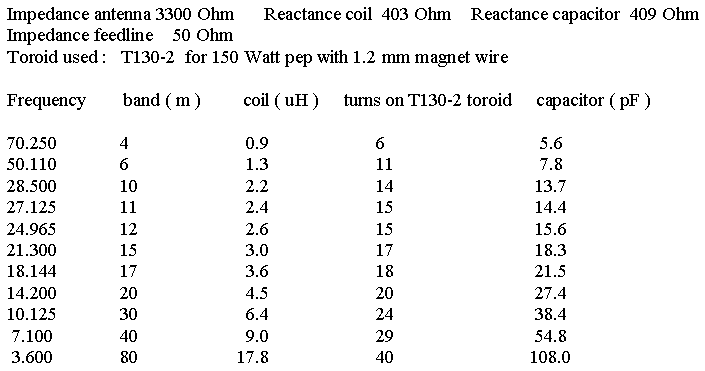 The 100-150pF capacitor gives a better match on 10m.and both windings start at the ground side of the coil .Don't try to stack toroids for more power for this will increase overall inductance . This makes it impossible to tune the high bands. The best results are obtained with a small toroid.....The 3 band antenna has a length of aprox. 10.1m. followed by a coil of about 34 uH ( 90 turns 1mm transformer wire on a 19mm pvc tube ) and a endpiece of about 1.85m , offering you a perfect vertical or horizontal antenna for fieldwork at 40 -20 and 10m. There is also a 5 band version with aprox. 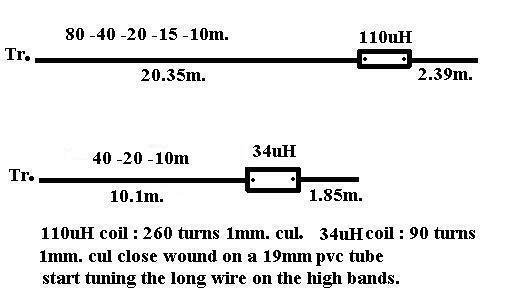 20.35m wire followed by a 110 - 120uH coil ( about 260 turns 1 mm transformer wire on a 19mm pvc tube ) and a aprox. 2.39m. endpiece. Use a longer wire for testing for surrounding objects can interact . 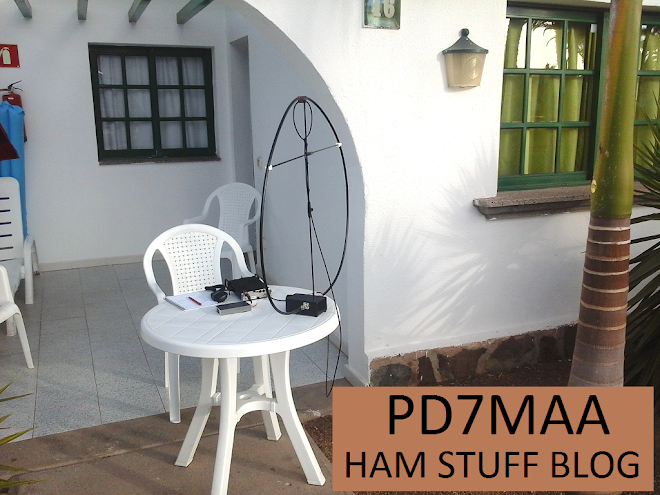 This antenna works on 80 - 40 - 20 -15 and 10m.without radials and has a verry low swr combined with a low noise level. Keep in mind that every end fed / vertical needs some kind of counterpoise to push against and in this case that's the coax , so don't forget a line choke near to your transceiver. Cul = transformer wire. My balcony however is 10m. long ,so i mounted a horizontal endfed antenna without the coil, for 20-10m on the wooden windowframe . Because of the capacity of the wood and the paint overall length was reduced to aprox. 9m.. but provided a near 1:1 swr on 20 and 10m. First contact on 10m. was with 5B4AHL (5-9) on cyprus folowed by 9K2QA (5-9) in Kuwait and 4S7VG (5-8) in SRI Lanka despite of a huge pile-up. This antenna is going to stay HI. If a high efficiency antenna is needed here are the data. Use thin 50 Ohm Teflon coax wire for the capacitor ( one side open ) . 1 cm coax is aprox. 1 pF. Tuning without the antenna : connect a 3300 Ohm resistor fom the coil end to the ground of the coax connector. cut the coax-capacitor carefully for lowest SWR . Connect the antenne and cut the antenna wire for best SWR . Disclaimer:I'm not responsable for any damage due to improper reproduction of my projects. Mutual respect is the key to global peace. Travel theme. Powered by Blogger.